Remember when I said I was going to post every Saturday? So much for that! This post is all about finding ways to stay happy, and let me tell you, not following through on my commitments—personal or otherwise—doesn’t make me happy. But nonetheless, everyone deserves a second chance. And seeing as this is my personal blog, I decided to give myself another chance at redemption. The main cause to my lack of posting wasn’t because I’ve gotten over the whole blogging thing. But rather, I have nothing going on in my life besides working full-time, going to the gym, and going to bed (truthfully). Because of that, it gives me little to no material to write about. However, after talking to several people, I have decided to get a few hobbies other than working out. Don’t get me wrong, I love a killer sweat sesh but working out doesn’t always make me happy. Working out can be stressful, especially if you’re someone like me who likes improving every single time whether it’s by beating my mile time, tacking on another mile or two to my distance runs, or increasing the amount of weight that I lift. Therefore, I wanted to find a hobby that was relaxing and didn’t cause me to feel stressed. Now, this may be easy for some people but I find it a bit more challenging. In the past, I’ve tried coloring books but wasn’t a fan because I not only found it overly tedious to color so precisely between the lines, but I felt the need to color perfectly (seeing as though I’m somewhat of a perfectionist). Another hobby that I took up during my high school years was playing guitar and songwriting. I truthfully thought that I was going to be the next Taylor Swift, and while I love jamming every now-and-then, I’m content with the songs that I know and the chords that I can play and don’t feel the need (or the want) to become a professional guitar player. You’re probably wondering what I have chosen to take up as a hobby considering the activities mentioned above I don’t want to pursue further. Well, I am happy to say that I have found 3 things that I do on somewhat of a daily basis that help me stay happy. How “art school” of me is it that I’ve taken up painting? Pretty dang art school-y if you ask me. But there’s just something so relaxing about mixing paint colors together and stroking the paintbrush along the paper. Since I have no professional painting training (but don’t you fret—I’m signed up for a modern paint training course through Joann Fabrics at the end of April), my mom suggested that I get coloring book pages and paint them. At first, I thought this was silly because when am I ever going to hang up a picture of an Easter bunny with some eggs? Probably never. But as my mom expressed to me, it doesn’t really matter if I ever plan on hanging it up or not. What matters is that I enjoyed my time painting the picture. Maybe you’re like me and find it really hard to find things in your life to be happy about. Keep in mind, there’s a big difference between finding things to be HAPPY about and finding things to be THANKFUL for. There are so many things that I’m thankful for in my life, but being thankful doesn’t necessarily equate to happiness. Someone recommended to me the book 52 Lists for Happiness, which I have been filling out daily. Every week, you’re presented with a new prompt that makes you think about the things in your life that you’re good at, the things in your life that make you happy, and the things in your life that you appreciate, among others. This book has really challenged me to think outside of the box and really take a look at my life and find the things that truly make me smile each and every day. Okay, okay. I totally get that listening to podcasts isn’t a hobby. But, it is something that makes me happy. I commute a little over 2 hours to work (back and forth) each day. For the first week or so of my new full-time job, I was listening to music. Don’t get me wrong, I love singing to Kacey Musgraves in the car and blasting Drake whenever I can. But, I found myself so uninspired and almost drained after spending 2 hours in the car mindlessly listening to music. One of my co-workers told me about the podcast The Morning Toast, and one of the Instagram bloggers that I follow started her own podcast called What We Said. I love The Morning Toast because it gives me the perfect dose of news, while still being entertaining. The two hosts, Jackie and Claudia Oshry are two of the funniest personalities I’ve ever encountered online. They’re both in their twenties and completely aware of millennial trends and pop culture. Because of their personalities, it makes listening to the news a lot more enjoyable. What We Said is my second favorite podcast because the two hosts, Jacie Marie Smith and Chelsey Curtis are best friends who complement each other so well. These two ladies talk about everything from embarrassing stories and dating, to interviewing social media influencers and entrepreneurs like Aspyn Ovard and @hairby_chrissy (two of my favorite Instagram accounts to follow). A lot of their episodes also talk about being a #girlboss and how to be successful on social media or whatever your side passions are. I highly recommend both of these podcasts for anyone who wants to listen to something entertaining, informative, and inspiring! What are your favorite things to do to fuel your happiness? Do you have any favorite podcasts? Let me know in the comments below! For as long as I’ve been alive, so it seems, I’ve had oily skin. Regardless of the time of year—winter or summer—my face would shine with the sheen of oiliness, and it wasn’t very cute to say the least. But this winter, things have took a turn and my face is no longer oily but rather incredibly dry. Honestly, I blame the Chicago air. Not only is the air disgustingly polluted (I’m pretty sure I get cigarette fumes blown into my face at least twice a week), but the air during the winter is very dry. So, I guess it was about time that my skin got plagued with dryness. I have tried so many things to help combat my dry skin, and to be perfectly honest, my skin is still dry. However, the products I’ve using as of late have helped with the pain and flakiness that comes with having dry skin. Today, I thought I’d share with you all my favorite products that I’ve been using and how I’ve been using them on a daily basis. As always, these products are 100% vegan and cruelty-free. Enjoy! I received this face oil from my Love Goodly box a few months ago. But, I just started using this product recently as the oil was a bit too much for my skin during the summer. Thank goodness I remembered this product because it has honestly been a lifesaver for my skin. I apply this face oil every morning after I wash my face and after I wash my face post-working out. I always make sure to apply it immediately after cleansing my skin in order to prevent my face from drying out from the water. For this product, a little bit definitely goes a long way. For application, I put a dime-sized drop of the oil into the palm of my hand and using my fingertips I massage the product into my skin. 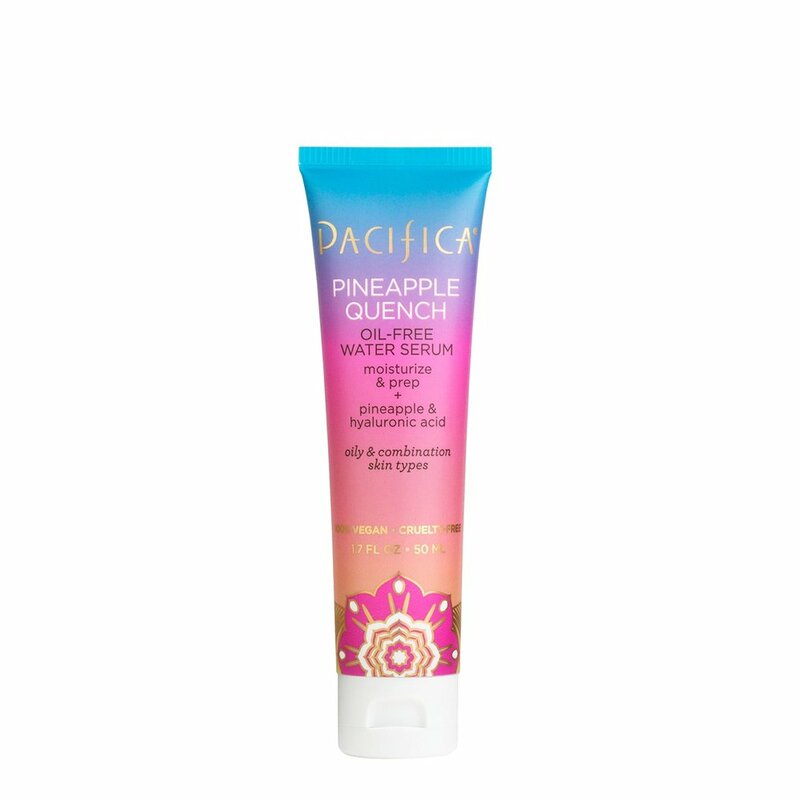 If you know me, then you know that I adore all of Pacifica Beauty’s products. They’re all 100% vegan and all-natural, and I haven’t met of product of theirs that I haven’t enjoyed. While I use the face oil (mentioned above) primarily for nighttime, I use Pacifica’s face serum during the day. Infused with hyaluronic acid, this serum is the ultimate moisturizer for days where the temperatures are below 30-degrees and it’s as dry as the Sahara Desert. Hyaluronic acid is a powerful serum that binds moisture into the skin. Regardless of its harsh (and TBH, kind of scary) name, the “acid” helps keep the skin hydrated for a longer period of time than run-of-the-mill moisturizers do. I’m not going to lie, my heart broke a bit when I found out that Tarte discontinued their Confidence Creamy Powder Foundation—it was my absolute favorite. Even though I used to do the whole shabang on my face and used an exuberant amount of liquid concealer and foundation, I have since moved away from caking my face with cosmetics and have instead opted for more lightweight options that make my skin look great in less than half the time. Tarte’s powder foundation is a holy grail of mine and works wonders as a full coverage, yet creamy option for everyday. However, since Tarte discontinued this product, I have been using It Cosmetics’ Celebration Foundation which is equally as fantastic, but a little bit more pricey. But, I’ve always been a firm believe in spending more money for quality products that are cruelty-free and created without animal byproducts. I use this product every morning when I feel like I need to wear just a bit of makeup to even out any discoloration or hide any “imperfections.” Instead of looking like I caked on a few layers of makeup, these powder foundations blend seamlessly into the skin and trick everyone to think that you’re actually not wearing any makeup. Plus, unlike liquid foundations, powder foundations don’t dry out your skin which is amazing for the wintertime. Even though I haven’t mastered the art of skin care quite yet, I feel like I’m getting closer to achieving a complexion that can strut its stuff without wearing any sort of makeup. Do you feel like you’ve mastered your skin care routine? If so, what are your go-to products? I love a good veggie burger. And by veggie burger, I mean packed with beans, veggies, and some sort of grain, not stuffed with wheat proteins, soy, or any artificial flavors or additives. When a few of my favorite restaurants featuring delicious veggie burgers switched from house-made, plant-loaded patties to the Impossible Burger, I was disappointed. However, when me and my parents visited Old Town Pour House in the Chicago suburbs last Spring, I decided that I would give it a try in lieu of not having anything else to eat for dinner. The base of the Impossible Burger is water and wheat protein (clearly not one of my favorite ingredients, per my explanation above), along with coconut oil, “natural flavors,” and other ingredients that are most certainty not whole foods—I’m looking at you konjac and xanthan gum. However, I can’t totally discredit the Impossible Burger for having a base of wheat protein, as most plant-based burger consumers are looking for great taste and a high number of grams of protein—the Impossible Burger comes in at 20 grams of protein per patty. While I was not thrilled with the ingredients in the Impossible Burger, I nonetheless decided to take a bite. My first reaction was the texture. It’s been a few years—over 4, to be exact—since I’ve eaten a McDonald’s single patty burger, but boy, did the Impossible Burger flash me back to my McDonald’s-eating days. To say I was grossed out is putting it nicely. The texture of the Impossible Burger was grainy and rubbery, like real meat is. Next, I noticed the flavor. Weirdly gamey and strangely meat-flavored—I hated it. I was so taken aback by the fact that the burger tasted like meat (and I was almost convinced that the Impossible Burger was lying about its vegan claims) that I did some research right there and then in the restaurant to reassure myself that the patty I had just bitten into was animal-free. One word: heme. The Impossible Burger uses a molecule called heme that is found in mostly everything. From people to plants, heme is a protein molecule that tastes like meat, yet is 100-percent free of animals. When I’m eating a vegan burger, I don’t want it to taste like an animal. I want it to taste like plants and the goodness that they offer. Bring on the beans, bring on the vegetables, and bring on the non-animal-tasting flavor. I do believe that this burger is great for people transitioning off meat and towards plants, but for us longtime vegans, we can do without the Impossible Burger. What’s your favorite veggie burger that you’ve bought in-store and tasted out at a restaurant? Let me know in the comments below, I’d love some inspiration!